The draft has become more important than ever during the hard salary cap era in the National Hockey League. In order to keep your championship window open, teams need to draft well to keep a steady influx of young and cheap players into their lineups. The Chicago Blackhawks have had their fair share of both hits and misses in the first round over the past decade-plus. After picking Jack Skille seventh overall the previous year, Tallon hit a home run by selecting Jonathan Toews with the third overall pick in 2006. Even though Tallon has said that Toews was the guy he wanted the whole time, he needed some luck in order to land him. The St. Louis Blues selected defenseman Erik Johnson first overall and then the Pittsburgh Penguins passed on Toews to draft Jordan Staal. 12 years later, there is no doubt that number 19 will be hanging from the rafters one day after captaining the Blackhawks to three Stanley Cups. Tallon completed the dynamic duo that would change the face of the franchise the following year when he selected Patrick Kane with the first overall pick. Heading into the draft, there was a lot of debate about who should be the number one pick between Kane, James van Riemsdyk and Kyle Turris. While van Riemsdyk and Turris have had solid careers, they have not even come close to the success Kane has achieved which includes a Calder, the 2013 Conn Smythe, a Hart and Art Ross Trophies. The streak of fantastic first round picks ended at two years when Kyle Beach was selected with the 11th overall pick in 2008. Beach averaged a point per game while racking up 418 penalty minutes with the Everett Silvertips of the WHL in his two seasons prior to being drafted. He was supposed to be a high-scoring power forward, but all he did was underachieve and get injured at the AHL level. In December of 2013, he was traded to the New York Rangers for Brandon Mashinter. Beach has never played a game in the NHL and has spent the last four seasons playing in Austria. After a run to the Western Conference Finals, the Blackhawks selected much later in the opening round than they had been used to. Tallon selected defenseman Dylan Olsen with the 28th overall pick. He picked up one assist in 28 games for the Blackhawks during the 2011-12 season. After toiling in Rockford for two more seasons, Olsen and Jimmy Hayes were traded to the Florida Panthers for Kris Versteeg and Phillippe Lefebvre. Versteeg would be a key role player in the Blackhawks run to the Conference Finals in 2014 and the Stanley Cup in 2015. 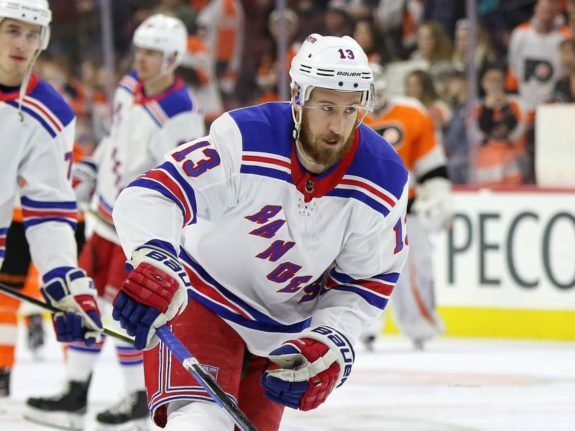 Bowman’s first draft pick as general manager was Kevin Hayes with the 24th overall pick in 2010. This pick would ultimately end up as a waste. Hayes never signed with the Blackhawks as he elected to become a free agent after his college career ended, choosing the Rangers. He has 73 goals and 174 points in 310 games in New York. Losing out on Hayes stings, even more, when you consider he was selected over other centers who were still on the board like Evgeny Kuznetsov, Charlie Coyle, and Brock Nelson. The Blackhawks had two first-round picks in 2011. Bowman used his first pick, 18th overall, on forward Mark McNeill out of the WHL. McNeill had some success in the AHL with 66 goals in his first three full seasons with the IceHogs, but that success never transferred to the NHL. 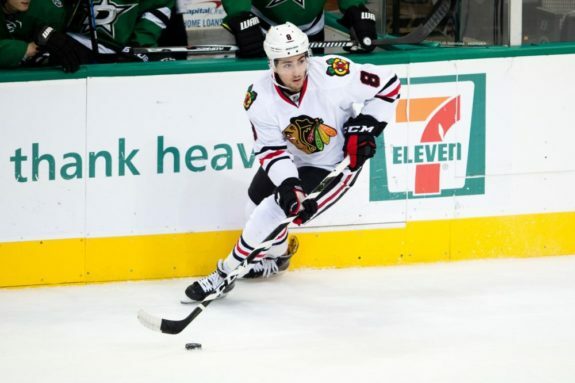 He played in just one game for the Blackhawks before being traded to the Dallas Stars for Johnny Oduya in 2017. He signed with the Boston Bruins earlier this month. Bowman acquired the 26th overall pick from the Washington Capitals for Troy Brouwer and used it to select Phillip Danault. The defensive-minded center had a goal and four assists in his 32 career games with the Blackhawks. He was traded to the Montreal Canadiens with a second-round draft pick for Tomas Fleischman and Dale Weise at the 2016 trade deadline. Fleischman and Weise never provided much for a team that lost in the first-round to the Blues. 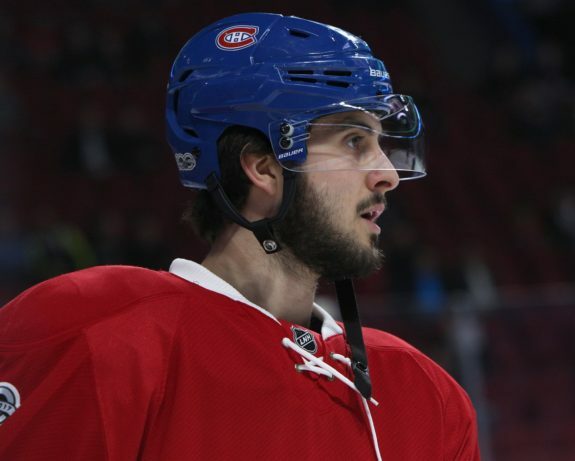 Danault just signed a new three-year contract with Montreal after scoring 24 goals and 70 points in 155 games. He would look very good on the Blackhawks third line these days. Final verdict: D. Neither player produced as hoped for the Blackhawks and the returns in their trades were minimum. The first-round of the 2012 NHL Entry Draft was one of the weirdest ones in recent memory. After a major run on defensemen early, there were many top 10 quality forwards still on the board when the Blackhawks selected at 18. Teuvo Teravainen was one of those forwards. Teravainen made his NHL debut late in the 2013-14 season and split the following season between Chicago and Rockford. 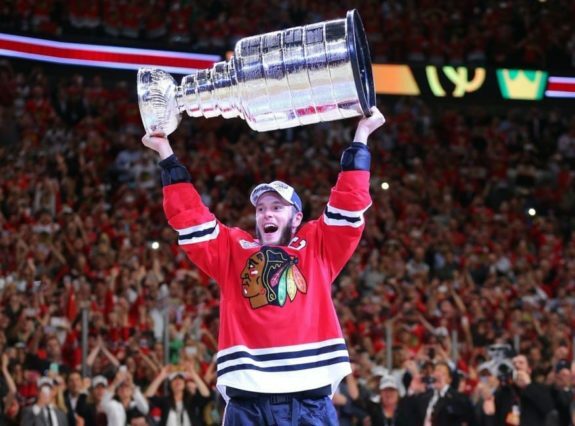 He dressed in 18 games and contributed some key goals in the Blackhawks 2015 Stanley Cup run. After playing up and down the lineup during the 2015-16 season, Teravainen was traded with Bryan Bickell to the Carolina Hurricanes for a 2016 second-round pick (Artur Kayumov) and a 2017 third-round pick (later traded to Detroit for Tomas Jurco). Teravainen had a career year last season with 23 goals and 64 points while playing in all 82 games. Final verdict: C+. The pick was very good but giving up on Teravainen so early just to shed Bickell’s cap hit was less than ideal. This grade can improve if Kayumov ever produces at the NHL level for the Blackhawks. The Blackhawks used the 30th overall pick to select gritty forward Ryan Hartman. An injury to Andrew Desjardins late in the 2016 preseason cemented Hartman’s spot on the NHL roster. He went on to score 19 goals and 31 points in his first full season with the Blackhawks. The production dropped a tad last season and he was eventually traded to the Nashville Predators for Victor Ejdsell, a 2018 first-round (Nicolas Beaudin) and a fourth-round pick (Philipp Kurashev). Hartman only had two goals during the Predators playoff run and was a healthy scratch in six of their 15 games. He recently re-signed for one more year with the Predators. Final verdict: C+. Much like the 2012 pick, this grade will improve greatly if the three players acquired become productive in Chicago. Ejdsell had a great postseason run with the IceHogs and is expected to make the opening night roster this fall. The Blackhawks did not have a first-round pick in either 2015 or 2016. The 2015 pick was sent to the Arizona Coyotes in exchange for Antoine Vermette, who selected right winger Nick Merkley. The 2016 pick was used to acquire Andrew Ladd from the Winnipeg Jets and was eventually used by the Philadelphia Flyers to draft center German Rubstov. Final verdict: C. Vermette became a key contributor during the 2015 postseason which ended with a Stanley Cup celebration. Ladd’s second go-round in Chicago was not nearly as successful as his first one. After 12 points in 19 regular season games, he had just one goal and one assist in a seven-game loss to the Blues. There was talk that the Blackhawks would shop their first-round pick prior to the draft, but they wisely held on to it. 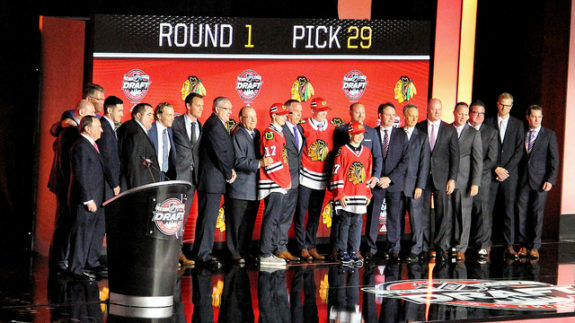 Bowman took to the United Center stage and announced that he was using the 29th overall pick on defenseman Henri Jokiharju. The young defender scored 12 goals and 71 points with the Portland Winterhawks in the WHL last season. He is the Blackhawks top defensive prospect and will get a long look this preseason. Some feel that he can compete for a spot on the opening roster. 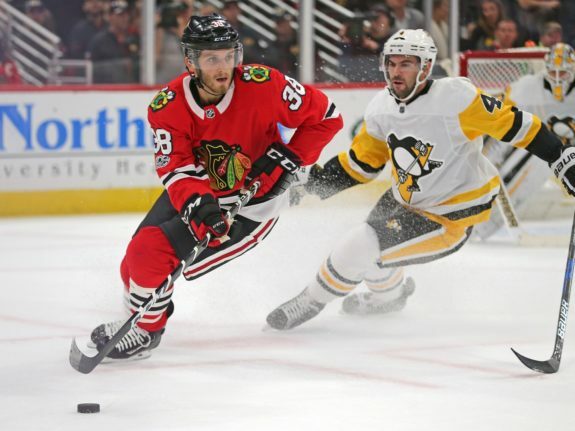 The Blackhawks had a pair of first-round picks this past June, thanks to the previously mentioned Hartman deal with the Predators. The Blackhawks first selection was the eighth overall pick, the highest Bowman has ever drafted in the opening round. He used the pick to select Swedish defenseman Adam Boqvist. The teenager was rated as the best skater in the draft and possesses great speed and sneaky release on his shot. His small size has some worried and he is at least two years away from competing for an NHL spot. Boqvist will play in the OHL this season for the London Knights. Bowman used the 27th overall pick to select another undersized defenseman in Nicolas Beaudin. The smooth-skating Beaudin scored 12 goals and 69 points in 68 games for the Drummondville Voltigeurs of the QMJHL last season. I profiled both Boqvist and Beaudin after last month’s draft.